Should You Write a Functional Resume? I recently received an email asking whether we have any experience in writing functional resumes. After talking to the job seeker on the phone, I learned that he’s making a career change. He thinks that he needs to distract employers from her background in one industry so they can imagine him in another. For this reason, he’s wondering about using a functional resume. I know we’re not supposed to use capital letters on the Internet because it means we’re shouting, but in this case, I am shouting, so my answer is “NO!” (Imagine lots of underlines underneath than “no”). 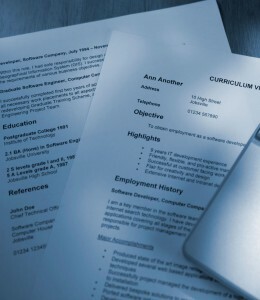 A functional resume is simply a resume that doesn’t present career history chronologically. Instead, the job seeker lists his accomplishments under various skills headings such as “HR management” or “IT leadership.” The idea is that this format enables you to communicate transferable skills without letting on that, in actual fact, your whole career to date has been in a completely different field. The problem with this type of resume writing is that, put simply, it doesn’t work. Recruiters are neither stupid nor inexperienced. They’ve been looking at resumes for a long time and they’ve seen every trick you can think of (and lots that never crossed your mind!). They know that the functional resume is a ploy to hide something. The only thing they don’t know right away is what you’re trying to hide. If they have a few minutes spare they might try and figure it out. But this is just for sport, you understand, because they’ve already decided they don’t like you very much. Obviously this is not the effect you were hoping for with your new resume! The truth is that if you want to make a career change, you really need to go about it very differently from a normal search. The key isn’t a clever resume or a great cover letter, although these can’t hurt. Successful career change requires a proactive strategy and an aggressive networking and personal contact campaign. Experienced HR executive looking to transition to career marketing – offers 15 years’ real world hiring experience, plus exceptional writing and marketing skills. This approach would be honest, straightforward and truthful, and would be much more effective than a “clever” structure that tried to cover up the truth, which was that – at that time – I had no paid experience in resume writing. The fact is, the more you try to cover up a lack of experience, the more obvious it becomes. Your tricks will simply draw attention to the facts. So if you’re looking to make a career change, try this novel tactic for selling yourself: Tell the truth! (And by the way, if the truth won’t help you get the job, the fact is that you’re not really qualified for it and have more work to do). Read more about Career Change, Resume Writing. I never use a purely functional (or as I call it, skill-based) résumé, but I have found that a hybrid between chronological and skill-based can be very effective. I recommend using the hybrid for networking, and a traditional, chronological résumé for applying online. I used a mostly functional resume throughout my Career. I listed skills as my headings, and then under each skill I placed my employment history. I totally disagree with the idea that functional resumes don’t work. I have seen many individuals receive interviews from functional resumes. A functional resume also lists past/present job titles with the employment place. Well if it works for you, Renee, good for you! But I would argue that there may be another reason you are getting interviews (a great background, good contacts, industry experience etc.) and that you might get even more if you created a more traditional resume. I’ve been recruiting a long time and I’ve never met a recruiter or HR Manager who responds well to a functional resume. But, like I said, if you’re happy with the results you’ve been getting that’s a good thing. How often do we see or hear that we get any job via people in our network. Our “brand” precedes us in these relationships and can be leveraged for a career course change. Hi Louise – I have never given functional resumes much thought other than they don’t look right. But I like the points you made because in today’s job market, you’re just wasting your own time if you’re trying to trick employers with how your resume is structured. I would always recommend to the job seekers on our website that a functional resume isn’t worth the time because as much leniency people now have with their resume, a functional resume will still stick out like a sore thumb. Now I can just direct them to this blog post! First of all, I am one of your avid fans. I have been reading your blogs and learned a lot from it. What if for example I would like to hide my age in the resume? Will a functional resume work for this? I am already 54 years old and worry that recruiters might discriminate me with my age. I am looking forward for your advise.